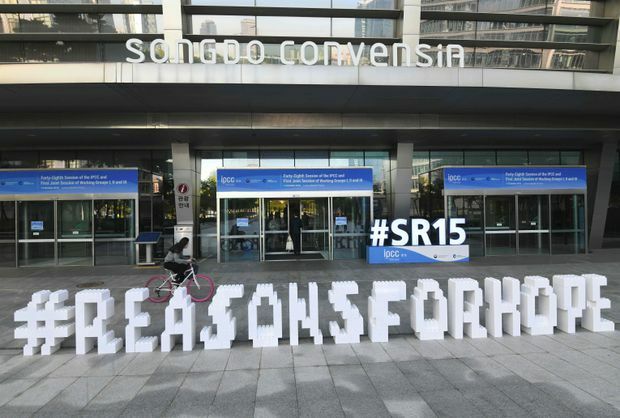 A display of letters reading '#Reasons for hope' was set up by Greenpeace activists prior to a press conference of the Intergovernmental Panel for Climate Change (IPCC) at Songdo Convensia in Incheon on October 8, 2018. Since 1993, I have occasionally participated as a climate policy expert on the Intergovernmental Panel on Climate Change. At our Edinburgh meeting the first week of April, I was struck by the sharp contrast between the consensus of foreign experts that Canada has become a global climate policy leader and the frequent assumption among concerned Canadians that our government is failing on climate. Why this discrepancy? The Trudeau government’s support of the TransMountain pipeline is one obvious reason: People wonder how a sincere government could build an oil pipeline. Another is the government’s admission that its climate plan won’t quite meet its 2030 target. Isn’t this a repeat of previously ineffective Conservative and Liberal administrations? Increasingly, however, I detect a third, less obvious reason: Few climate-concerned Canadians know much about the slate of new federal climate polices, except for the contentious carbon tax. And while global experts agree that the national carbon tax is impressive, they are equally impressed with several other climate policies. The government’s phased closure of coal plants is crucial to climate-policy experts who know that humanity must eliminate coal-fired power, first in rich countries and soon after in developing countries. To advance this global objective, the Canadian government has leveraged its policy leadership by co-founding with Britain the Powering Past Coal Alliance, a growing force of jurisdictions committed to phasing out coal. My counterparts in China and India already notice the influence on their own countries’ policies. Global success depends, however, on co-ordinating electricity decarbonization with increasing its use in vehicles, buildings and industry. Our government understands this. In addition to its carbon tax, its clean fuel standard will accelerate the switch in transportation from gasoline and diesel to electricity and sustainably-produced biofuels. Experts around the world are studying this policy, which comes fully into force in two years – if the government is re-elected. It offers a viable alternative for the many jurisdictions unable to implement significant carbon pricing for political reasons. Several U.S. states are considering a version of this policy that California and British Columbia originated a decade ago, called the low carbon fuel standard. Our hopes for global success increase as political leaders in developing countries realize that the rapid adoption of electric vehicles will abate the smog choking their cities – and their families. Policies such as the clean fuel standard can accelerate this transition and, if co-ordinated with coal phase-out, ensure that falling emissions from gasoline and diesel will not be offset by rising emissions from electricity generation. The government’s pending regulation on methane emissions is another example of a policy of global significance that is unknown in Canada. Flexibility provisions in the policy will ensure that emitters such as the oil and gas industry can choose the least-cost options to reduce these emissions. Again, other countries are studying this policy. Yet another key policy recognizes that forcing costly reductions by Canada’s emissions-intensive industries is ineffective if it simply causes an increase in production elsewhere. By adopting Alberta’s regulatory ingenuity, the federal government’s new output-based pricing system for large industries incentivizes their emission reductions without significantly increasing their production costs. Rather than avoiding industrial regulation altogether, like some jurisdictions, Canada is innovating a model of growing interest to policy-makers in developed and developing countries. In just four years, these and other policies have transformed Canada from a global pariah under the Harper government to a model for climate action under Trudeau. Perhaps the government will build a new oil pipeline and will also miss its 2030 target. But these don’t matter much for the global climate challenge. What matters enormously is the continued implementation of Canada’s emerging, effective climate policies, especially those with global influence. And if the resulting intensified global effort more quickly reduces the world-wide demand for gasoline and diesel, which the planet so desperately needs, then the TransMountain pipeline can shift to transporting different Albertan products, perhaps hydrogen produced from the oil sands or sustainably-produced biofuels on the prairies. In climate policy, experts agree that Canada is finally a global leader. I wonder if enough climate-concerned Canadians will recognize this, before it’s too late.